Regular readers know just how fond I am of baking. Christmas is no exception. I love creating a big dessert table laden with sweet treats of all shapes and sizes. I may go a little overboard but if not Christmas time…when? You don’t have to be a great cook or love baking to make Christmas Day sensational. Here are three, super easy hack ideas using products I sourced at Woolworths . They require zero baking and minimum prep. I am yet to meet someone who doesn’t like a Brandy Snap. And few things say Australian summer more than berries, lemons and passionfruit. This dessert is about the easiest thing you’ll ever make but with huge visual impact. I simply whisked together a jar of ready-made lemon curd (Woolworths have a great selection) with a small container of Woolworths Sour Cream and then filled each baskets. I topped them with fresh raspberries and passionfruit but any tropical fruit works just as well. I used Woolworths Whipped Cream to pipe the tubes and decorated the platter with leaves from the garden and extra berries. 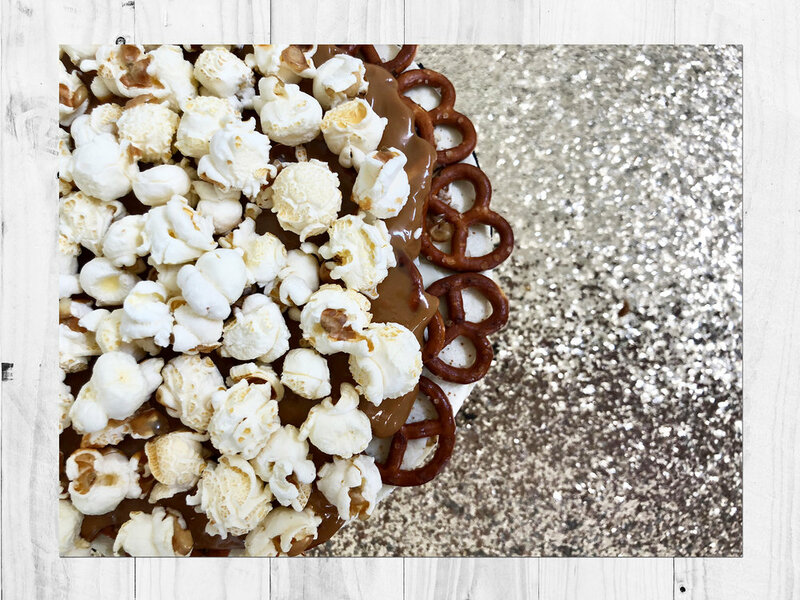 WHAT YOU’LL NEED: 2 x Woolworths Gold Indulgent Carmel Chocolate Cake; Woolworths Original Gluten Free Popcorn 10 pack, $2.75; Woolworths Select Pretzels Twists, $2.80; 375 grams x Dulche De Leche; Woolworths Gold Star Ornament, $4 (4 pack). Woolworths Gold Range is your go-to for ready made desserts. The cakes in this range are so pretty that really you don’t need to do anything other than take the wrapping off. However…when I saw the Woolworths Gold Indulgent Carmel Chocolate Cake I couldn’t help to think just how major I could make it with a few tiny tweaks. Unwrap both Woolworths Gold Indulgent Carmel Chocolate Cakes and remove white chocolate baubles from the base cake and set aside. Carefully place pretzel layer over the top of the iced base cake. Then smooth over a liberal layer of Dulce De Leche or store bought caramel. Add layer of popcorn and then carefully place the second cake on top to make a tower. Finish with gold star ornaments and the additional white chocolate baubles. Christmas Cookie & Donut Trifle. This kids themed trifle is as much a table centrepiece as it is a crowd pleaser. The idea for this crazy trifle started when I discovered the new Woolworths Iced Christmas Cookies. 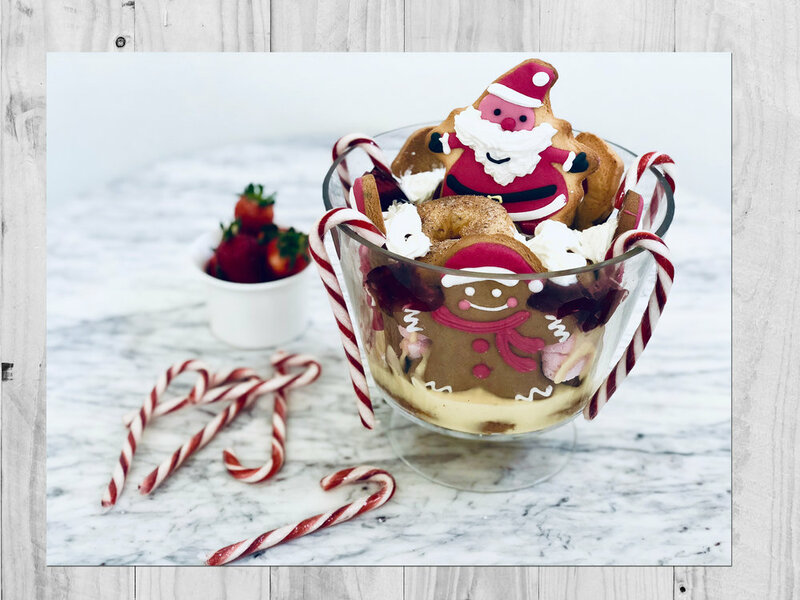 I originally bought them as tree ornaments but then I found this cool Trifle Bowl which was exactly the same height as the gingerbread men and dreamt up this deconstructed trifle. Assembly is really limited only by your imagination but if you want to follow my lead, it goes like this: donuts on the base, gingerbread around the perimeter of the trifle bowl (you’ll need five); pink marshmallows in the holes between the cookies and the donuts. Next add a layer of custard, then a layer of cubed jelly (I didn’t even make the jelly. I cut Woolworths Blackcurrant Jelly 4 Pack, $2.20 into small pieces). Top with a Santa or reindeer cookie, extra donuts, whipped cream and candy canes on the rim. Why Retinol Is The Great Eraser.